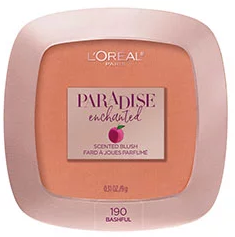 After L'Oréal came out with Paradise mascara it became so incredibly popular they decided to have an entire collection based around this mascara. 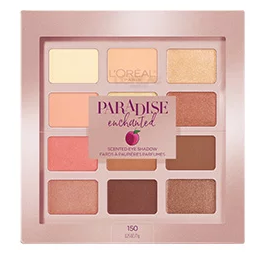 It is called the L'Oréal Paradise Fruit-Scented Makeup Collection. This collection has an eyeshaow palette, four blushes and the Paradise Mascara. These blushes smell like ripe peaches. Get enchanted with subtle peach and apricot hues to natural pops of coral and peach. They come in four shades: Bashful (very light peach), Just Curious (brighter peach), Fantastical (bright coral) and Charming (brownish peach). Four captivating warm tones of blush that go from tonal peach hues to pops of coral. Creamy texture, soft to the touch. Silky feel, subtle yet radiant color. From a range of shimmering pearls to a matte finish, you will have everything you need to create endless enchanting looks. The soft, velvety texture allows for ultra-blendable application, rich color pay off and long lasting results. Scented blush is infused with an enchanting fruit scent for the ultimate sensorial experience to take your paradise to the next level. I tried three of the colors: Bashful, Fantastical and Charming. All were very pretty on. Looks good with my neutral skin tone. My best color is Fantastical. Bright pop of coral. Just like the fruit scented blushes, the eyeshadow palette is also scented. In it come 12 captivating warm eyeshadow shades in a variety of finishes, from mattes to shimmering pearls, for endless enchanting eyeshadow looks. Shades include creamy ivory, rosy nudes, bronzed ambers and pops of coral pinks. From a range of shimmering pearls to a matte finish, you will have everything you need to create endless enchanting eye looks. The soft velvety texture allows for ultra-blendable application and rich color payoff. The scented eyeshadow palette is infused with an enchanting fruit scent for an ultimate sensorial experience. Worn along with this was Paradise mascara mostly and sometimes the new Voluminous Burgundy mascara, which looks lovely with my green eyes. L'Oréal Paris USA items are all available now at mass market retailers and can even be purchased at Ulta Beauty. L'Oréal Paris Cosmetics are sold at mass market retailers, such as Walgreens, Rite-Aid, CVS, Target, WalMart and Ulta Beauty nationwide. Like L'Oréal Paris on Facebook: https://www.facebook.com/lorealparis; Follow L'Oréal Paris on Twitter:@LOrealParisUSA; Subscribe to the L'Oréal Paris YouTube channel http://www.youtube.com/user/lorealparisnyc; Follow L'OréalParis on Instagram: http://instagram.com/lorealparisusa and Follow L'Oréal Paris on Google+:https://plus.google.com/104462448073132092737/about.